Andy is 50 percent Whippet, 25 Greyhound plus he has both spaniel and pointer DNA. he is now aged approximately six years old. 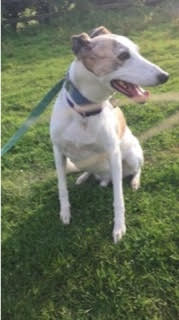 this lovely boy has had a sad time , originally from Ireland he was rescued and rehomed by a lady in England in 2012, he lived with an older greyhound and was happy but sadly his owner developed an inoperable brain tumour, when she became too ill to look after the dogs they came to a foster home in the South of England in August 2017. 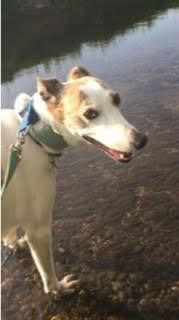 Andy is very loving, obedient indoors and easy to live with, he lives with elderly Greyhounds but he would prefer to be an only dog as he can be a bit grumpy when they take his humans attention away from him. Outside however Andy is only interested in chasing birds etc and does not have any recall, therefore he is always lead walked and he has settled well into this routine. He would be ideal living with an active person who likes to be be out or someone who enjoys long walks. Andy loves people and he is very good with children. He is neutered and fully vaccinated. Andy is living in the south of England at present but could travel. Please can you help this delightful boy.